"A-line wedding dresses are complimentary to a variety of body shapes," most fashion experts say, and I agree with them. An a-line bridal gown silhouette forms the capital "A" shape. It usually is fitted through the bust and waist areas and flares from the sides. How does this dress help your figure? "It's all about where the flare starts." This shape makes your figure appear smaller above the point where the dress starts to flare. The widening out of the hem forms this illusion. Because this silhouette hide figure flaws . . . it’s a favorite among brides. As you try on wedding dresses . . . pay attention to where the flare starts on the side seams of the bridal gown. This can mean the difference in your gown “accentuating the positives” of your figure or focusing on your “problem spots. It’s easy to see why the a-line bridal dress style is very popular with brides. Wedding Dress Tips: Make sure the flare of the bridal gown starts above your trouble spot. Take for instance... if your stomach isn't as flat as you would like it to be. . . make sure your dress flare starts at the waist or no more than an inch or so below the waist for a slimmer look. If your trouble spot is your hip/thigh area . . . make sure the flare on your bridal dress starts somewhere at your upper hip abdomen area. This way the focus of attention will be on your small waistline and/or upper body area. Choose an a-line wedding gown if you like timeless classic designs. If you are the type who tends to be nostalgic and plan to preserve your gown, this style is one that stands the test of time. What Body Shapes Look Best In A-line Wedding Dresses? The Pear Shape Body Type. This body shape benefits from the a-line silhouette if the gown flare starts higher at the sides than the widest part of the body. Depending on how wide the hips or thighs are, the higher the flare would need to start in the skirt. The Rectangle Body Shape Type. The flare starting at the abdomen level will give the illusion of a smaller waistline. Also, the flare starting at the waist can be flattering. The Apple Shaped Body Type. The flare should start above the waist and at the waist, especially if you have a protruding stomach. The best case scenario would be for it to flare at the sides and at the front skirt of the gown. 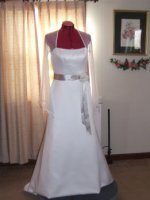 You can try an a-line wedding dress that start flaring from a dropped-waist style, if your stomach isn't a problem. The Hourglass Body Type. This body shape will look great in this style, especially if the a-line begins lower at hip or thigh level. This will show off your curves. Your really can't go wrong when you pick an a-line wedding dress. How can you identify which body shape type you are? Go to Choose Your Bridal Gown According To your Body shape. Get advice on how to determine what body type you are and how to pick a wedding dress that will flatter you.